Bernie Sanders Seeks Common Ground With A Different Kind Of Base: Evangelicals : It's All Politics The Jewish Democratic presidential candidate admitted differences with his conservative Christian audience at Liberty University, but called for civil discourse on social justice and morality issues. Sen. Bernie Sanders speaking at Liberty University on Monday. Vermont Independent Sen. Bernie Sanders was preaching to a different kind of choir at Liberty University on Monday. The Democratic presidential candidate tried to find common ground when talking about poverty and income inequality before the conservative Christian university student body. "I came here today because I believe that it is important for those with different views in our country to engage in civil discourse — not just to shout at each other or make fun of each other," Sanders began. "It is very easy for those in politics to talk to those who agree with us. I do that every day. It is harder, but not less important, to try to communicate with those who do not agree with us and see where, if possible, we can find common ground and, in other words, to reach out of our zone of comfort." Sanders was doing just that by appearing at Liberty. It was an unusual move for the Jewish politician, a self-described socialist, to appear at such an iconic evangelical university on the high holy day of Rosh Hashana. He acknowledged he had many differences with the school's leaders and most of the student body at the largest Christian university in the country, particularly on abortion and gay marriage, and Sanders was unapologetic for his liberal views on those social issues. But he spent the bulk of his time trying to find that common ground with the nearly 12,000 students who had gathered for mandatory convocation. He talked about the problems of wealth inequality, the absence of health care and fair wages for the poor and what America's response should be. For the foundation of that belief, he looked to the Gospel, quoting Matthew 7:12, commonly known as the Golden Rule: "So in everything, do to others what you would have them do to you, for this sums up the Law and Prophets." "We live, and I hope you know this, in the wealthiest country in the history of the world, but most Americans don't know that, because almost all of that wealth and income is going to the top 1 percent," Sanders said. "When we talk about morality and when we talk about justice, we have to, in my view, understand that there is no justice when so few have so much and so many have so little," Sanders continued. "There is no justice when the top one-tenth of 1 percent today in America owns almost as much as all of the wealth at the bottom." Bemoaning that ballooning wealth, Sanders said it's one of the leading contributors to the high rate of child poverty, too. "In my view, there is no justice, and morality suffers, when in our country millions of children go to bed hungry," Sanders added. "That is not morality, and that, in my view, is not what America should be about." Sanders extended that same logic to his belief that universal health care should be available to all, along with paid maternity leave. "In my view there is no justice when thousands of Americans die every single year because they don't have any health insurance and don't go to a doctor when they should," he said. "That is not justice. That is not morality. People should not be dying in the United States of America when they are sick." Most of Sanders' points got polite applause from the crowd, save for a group of louder outside supporters who were attending the event. The school has invited every presidential candidate, regardless of party, to address its student body. Sen. Ted Cruz, R-Texas, kicked off his presidential campaign during one of the school's convocation gatherings last spring, while former Florida Gov. Jeb Bush delivered the commencement address in May. Sanders — the only Democrat to accept university president Jerry Falwell Jr.'s invitation — said that while many students may disagree with him or not support him, he still hoped they would take things away from his speech. "I would hope very much that as part of that discussion and part of that learning process, some of you will conclude that, if we are honest in striving to be a moral and just society, it is imperative that we have the courage to stand with the poor, to stand with working people and, when necessary, take on very powerful and wealthy people whose greed, in my view, is doing this country enormous harm," he concluded. Sanders answered some questions from the student body following his speech — again reiterating his support for abortion rights — but tried to find common ground again on how the country could eradicate racism and work with other countries to help refugees from the Syrian migrant crisis. 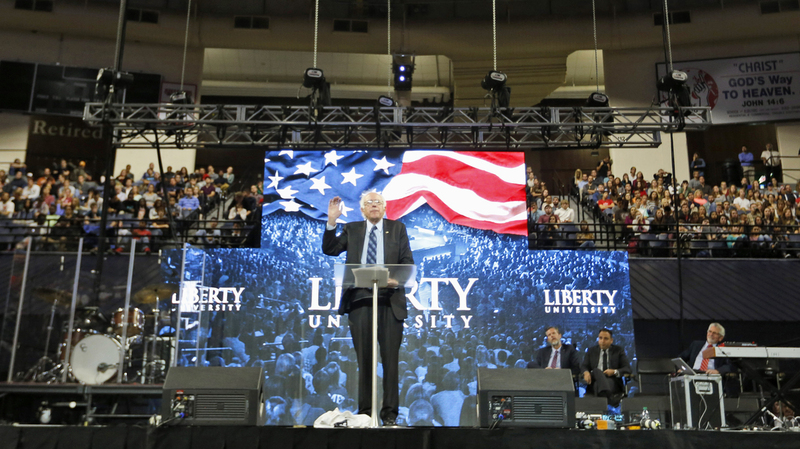 When Liberty University Vice President for Spiritual Development David Nasser concluded by asking Sanders how they could pray for him and his family as he continued on the campaign trail, Sanders offered a supplication instead for a restoration of wealth equality in the country to help the children and the poor.